This new DVD is aimed at teams who need to progress with their training. It is very much a "thinking persons DVD" as it gives you the strategies to take your own dogs training to the next stage. It contains lots of tips to put the polish and finesse to your performance. Take the principles shown to develop your own dogs strength moves and create that winning performance. Some of the subjects covered are proofing moves, using body signals, working without food, developing strength moves plus much more. This is a great new DVD for anyone considering entering the Heelwork to music division or who may want to teach some of the more unique heelwork positions. Heelwork to music is very different from Freestyle as it requires the dog to be in one of eight heelwork positions for two thirds of the routine. Each of the UK's eight heelwork positions are explained and how these can be linked together. Richard presents this DVD in his usual straighforward style and gives tips throughout the DVD so that you can construct an interesting HTM routine. Other aspects of HTM covered on the DVD are pivots, circles, directions, music, competition preparation. This DVD will aid beginners right through to more seasoned competitors. Watch an exert from the DVD by clicking here. As the title suggests this DVD deals with the many different types of moves that can be used in Heelwork to music and Freestyle. Updated from the previous The Moves this DVD now is just under two hours and is packed with many tips for the new handler. Richard Curtis presents the DVD showing with various dogs at different levels of training what can be achieved in a short period of time. Each move is briefly explained and shown and then ways of using that move in a routine, to make it look different. Lots of moves are shown from the static moves to the action moves right through to the "crowd pleasers". Another training DVD presented in Richard's normal straightforward enthusiastic style. 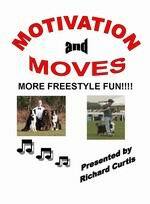 Richard shows how to get your dog to perform some of his innovative moves and also how to keep you dog motivated. Subjects covered on this video * Control work for freestyle * Technical moves like head turns and look between the legs * Back leg up two methods * Fun moves like digging and paw holding pole * Plus how to teach the back to back move and much much more!! This book is an excellent idea for anyone in the sport of heelwork to music or freestyle. In an easy to read style it takes you through the basic moves as well as onto more advance moves. Hints and tips are given throughout the book which will aid in you in your training. The book culminates with a chapter on how to put a routine together and then how to beat the nerves on the day of the show. A unique DVD which follows Pogo from 8 weeks until her first competition at 19 months old. This DVD has many hints and tips for training and developing you puppy and gives you an idea of what you can achieve at various ages. Watch as Pogo grows up and see the progression she makes from a small ball of fluff to confident performer. Your products will be posted by UK Royal Mail.